Welcome To Gulf Gate Condominiums - Panama Beach, FL! 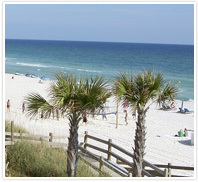 Gulf Gate is located in the heart of Panama City Beach, Florida. Home to the most beautiful sugar sand beaches in the world. 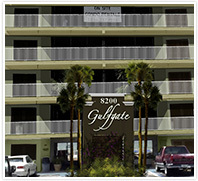 Affordable rates, nearby recreational activities and a heated pool overlooking the beach are the hallmarks of Gulfgate. What will make your vacation stay memorable at Gulfgate Condominium is the family atmosphere we promote and the exceptional customer service we provide to our patrons. Nothing compares to the gorgeous multi-colored sunsets or the pristine beaches that lead to the beautiful emerald green waters of the Gulf of Mexico. Your trip to the beach wouldn’t be complete without staying at Gulfgate. Rent one of our spacious condominiums and come enjoy a slice of Northwest Florida’s Paradise! The condominiums at Gulfgate are among the most spacious and beach-accessible in Panama City Beach. Located directly on the Gulf, our condominiums are literally steps from the sand. All of our condominium units are Gulf front and offer a private balcony with an unobstructed view of the Gulf. Sit on the balcony and enjoy your vacation in style. You can see for miles down the beach in either direction. Located on the East end (quiet/family side) of Panama City Beach, Gulfgate is close by to dining, local attractions, mini-golf, and family fun centers; yet is secluded enough for you to completely relax. If you’re up for exploring, Pier Park and St. Andrews State Park are just a short drive away.